Maker (MKR) is a utility token, governance token and recapitalization resource of the Maker system - a two-token system that includes both the MKR and DAI ERC-20 tokens. Both use ETH as a trading pair. 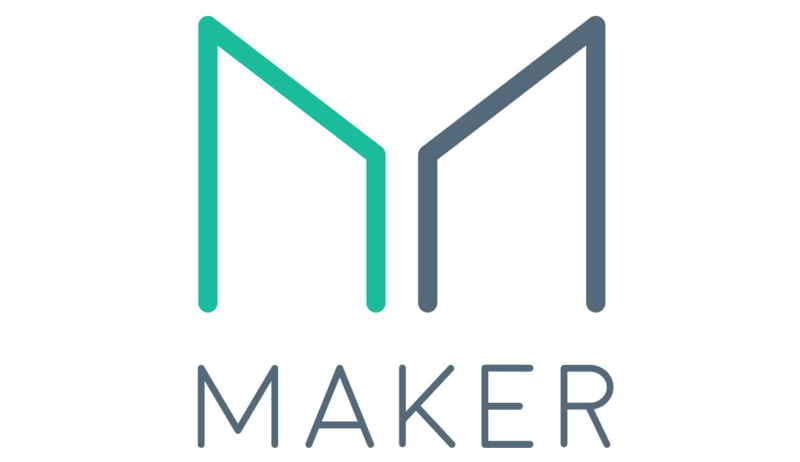 Maker was announced in August 2015 as the “first tradeable token on the ethereum network.” It raised funds by issuing MKR tokens for BTC and ETH through its own exchange, before the launch of the Maker platform in April 2016. The platform enables anyone to leverage their ethereum assets to generate dai on the Maker platform. Once generated, dai can be used in the same manner as any other cryptocurrency: it can be freely sent to others, used as payments for goods and services, or held as long-term savings. Holders of maker vote upon adjustments to the platform in order to keep dai pegged to the value of 1 USD, and to keep the system solvent. If the dai fund cannot remain solvent, new MKR tokens are printed and sold to fund the dai system. Maker cannot be mined. Maker (MKR) is currently listed as the 23rd largest cryptocurrency in terms of market capitalization on CoinMarketCap.com. 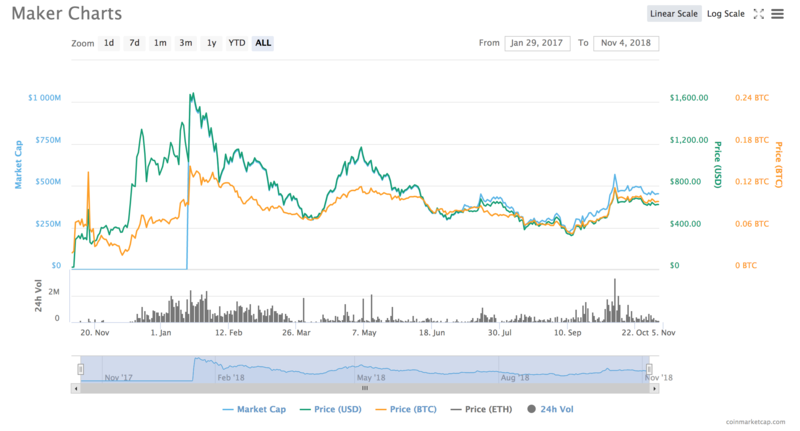 With a total market cap of $453,661,984 and a $223,393 daily trading volume, one MKR token currently costs $622. MKR is listed on a number of exchanges including OKEx, OasisDEX, Kyber Network, Ethfinex, Bibox, Bancor Network, HitBTC, IDEX, Gate.io, DragonEX, GOPAX, Radar Relay, DDEX, and BitMart. Dai is a fully collateral-backed currency token whose value is kept predictable relative to the U.S. Dollar. Dai is an asset-backed, hard currency for the 21st century. It is the first decentralized stablecoin on the ethereum blockchain. “With dai, anyone anywhere has the freedom to choose a money they can place their confidence in. A money that maintains its purchasing power” reads a post on its official website. The dai stablecoin is a collateral-backed cryptocurrency whose value is stable relative to the U.S. dollar. During periods of high market instability, dai offers a safe harbor to store value without having to exit the crypto space. The dai stablecoin system was designed to solve the crucial problem of stable exchange of value in the ethereum ecosystem and the wider blockchain economy, says the team behind the project. “We believe that the mechanism through which dai is created, transacted, and retired, along with the direct Risk Management role of MKR holders, will allow for self-interested Keepers to maintain the price stability of dai over time in an efficient manner,” the founders say. The development roadmap is aggressive and focused on the widespread adoption of dai in a responsible fashion. With a total market cap of $67,443,468 and a daily trading volume of $4,209,244, dai is currently ranked as the 96th largest cryptocurrency, according to price tracker CoinMarketPCap.com. Since both MKR and dai are standard ERC-20 tokens, they can be stored on any ERC-20 compliant wallet. MakerDAO's Dai and Tether are both stablecoins, but the similarities end there. 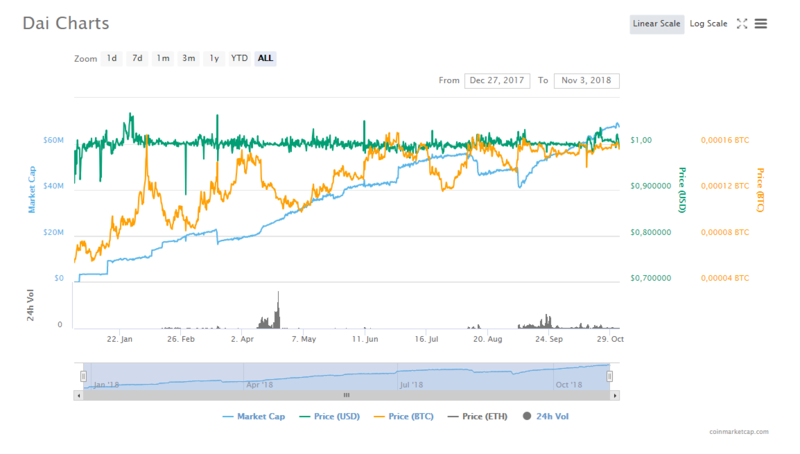 While Tether (USDT) is probably the most well-known stablecoin, it is at the center of a lot of controversy. Some critics and regulators even doubt it’s backed by fiat currency. Many even allege it was used to manipulate the price of bitcoin in 2017. MakerDAO uses a different approach to stabilize DAI using its proprietary MKR token. Backing DAI isn’t the U.S. dollar or any other fiat currency – it’s ethereum and the whole system is built on blockchain technology and a smart contract ecosystem.